An Arrhythmia is a heartbeat that’s too fast, too slow or irregular (uneven). 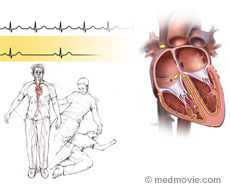 Arrhythmias are caused by problems with your heart’s electrical system. The electrical signals may fire too fast or too slowly, or in an uneven (irregular) way. When you have an arrhythmia, your heart may seem to skip beats or flutter. The term bradycardia describes a heart rate that’s too slow (less than 60 beats per minute). Tachycardia usually refers to a resting heart rate that’s too fast (more than 100 beats per minute).